The Centrum Wiskunde & Informatica (abbr. CWI; English: "National Research Institute for Mathematics and Computer Science") is a research center in the field of mathematics and theoretical computer science. It is part of the Netherlands Organisation for Scientific Research (NWO) and is located at the Amsterdam Science Park. This institute is famous as the creation ground of the Python Programming Language. It was a founding member of the European Research Consortium for Informatics and Mathematics (ERCIM). The Netherlands Organisation for Scientific Research is the national research council of the Netherlands. NWO funds thousands of top researchers at universities and institutes and steers the course of Dutch science by means of subsidies and research programmes. NWO promotes quality and innovation in science. Johannes Gaultherus van der Corput was a Dutch mathematician, working in the field of analytic number theory. David van Dantzig was a Dutch mathematician, well known for the construction in topology of the dyadic solenoid. He was a member of the Significs Group. Marcel Gilles Jozef Minnaert was a Dutch astronomer of Belgian origin. He was born in Bruges and died in Utrecht. He is notable for his contributions to astronomy and physics and for a popular book on meteorological optics: Light and colour in the open air, first published in English in 1940. The computer science component developed soon after. Adriaan van Wijngaarden, considered the founder of computer science (or informatica) in the Netherlands, was the director of the institute for almost 20 years. Edsger Dijkstra did most of his early influential work on algorithms and formal methods at CWI. The first Dutch computers, the Electrologica X1 and Electrologica X8, were both designed at the centre, and Electrologica was created as a spinoff to manufacture the machines. Adriaan "Aad" van Wijngaarden was a Dutch mathematician and computer scientist, who is considered by many to have been the founding father of informatica in the Netherlands. The Electrologica X1 was a digital computer designed and manufactured in the Netherlands from 1958 to 1965. About thirty were produced and sold in the Netherlands and abroad. The Electrologica X8 was a digital computer designed as a successor to the Electrologica X1 and manufactured in the Netherlands by Electrologica NV between 1964 and 1968. Operations research, or operational research (OR) in British usage, is a discipline that deals with the application of advanced analytical methods to help make better decisions. Further, the term 'operational analysis' is used in the British military as an intrinsic part of capability development, management and assurance. In particular, operational analysis forms part of the Combined Operational Effectiveness and Investment Appraisals, which support British defense capability acquisition decision-making. 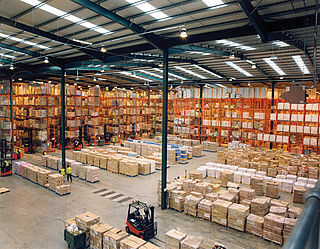 Logistics is generally the detailed organization and implementation of a complex operation. In a general business sense, logistics is the management of the flow of things between the point of origin and the point of consumption in order to meet requirements of customers or corporations. The resources managed in logistics can include physical items such as food, materials, animals, equipment, and liquids; as well as intangible items, such as time and information. The logistics of physical items usually involves the integration of information flow, materials handling, production, packaging, inventory, transportation, warehousing, and often security. The Gödel Prize is an annual prize for outstanding papers in the area of theoretical computer science, given jointly by European Association for Theoretical Computer Science (EATCS) and the Association for Computing Machinery Special Interest Group on Algorithms and Computational Theory. The award is named in honor of Kurt Gödel. Gödel's connection to theoretical computer science is that he was the first to mention the "P versus NP" question, in a 1956 letter to John von Neumann in which Gödel asked whether a certain NP-complete problem could be solved in quadratic or linear time. ACM SIGACT or SIGACT is the Association for Computing Machinery Special Interest Group on Algorithms and Computation Theory, whose purpose is support of research in theoretical computer science. It was founded in 1968 by Patrick C. Fischer. The Spinoza Prize is an annual award of 2.5 million euro, to be spent on new research given by the Netherlands Organisation for Scientific Research. The award is the highest scientific award in the Netherlands. It is named after the philosopher Baruch de Spinoza. 1956: Electrologica, a pioneering Dutch computer manufacturer. 1971: SARA, founded as a center for data processing activities for Vrije Universiteit Amsterdam, Universiteit van Amsterdam, and the CWI. 1990: DigiCash, an electronic money corporation founded by David Chaum. 1994: NLnet, an Internet Service Provider. 1994: General Design / Satama Amsterdam, a design company, acquired by LBi (then Lost Boys international). 1995: Data Distilleries, developer of analytical database software aimed at information retrieval, eventually becoming part of SPSS and acquired by IBM. 1996: Stichting Internet Domeinregistratie Nederland (SIDN), the .nl top-level domain registrar. 2000: Software Improvement Group (SIG), a software improvement and legacy code analysis company. 2008: MonetDB, a high-tech database technology company, developer of the MonetDB column-store. 2008: Vectorwise, an analytical database technology company, founded in cooperation with the Ingres Corporation (now Actian) and eventually acquired by it. 2010: Spinque, a company providing search technology for information retrieval specialists. 2013: MonetDB Solutions, a database services company. 2016: Seita, a technology company providing demand response services for the energy sector. Guido van Rossum is a Dutch programmer best known as the author of the Python programming language, for which he was the "Benevolent dictator for life" (BDFL) until he stepped down from the position in July 2018. MonetDB is an open-source column-oriented database management system developed at the Centrum Wiskunde & Informatica (CWI) in the Netherlands. It was designed to provide high performance on complex queries against large databases, such as combining tables with hundreds of columns and millions of rows. MonetDB has been applied in high-performance applications for online analytical processing, data mining, geographic information system (GIS), Resource Description Framework (RDF), text retrieval and sequence alignment processing. Cornelis Hermanus Antonius "Kees" Koster was a Dutch computer scientist who was a professor in the Department of Informatics at the Radboud University Nijmegen in the Netherlands. Lambert Guillaume Louis Théodore Meertens or L.G.L.T. Meertens is a Dutch computer scientist and professor. He is currently a researcher at the Kestrel Institute, a nonprofit computer science research center in Palo Alto's Stanford Research Park. Hendrik Willem Lenstra Jr. is a Dutch mathematician. Johannes Aldert "Jan" Bergstra is a Dutch computer scientist. His work has focussed on logic and the theoretical foundations of software engineering, especially on formal methods for system design. He is best known as an expert on algebraic methods for the specification of data and computational processes in general. The ARRA was the first Dutch computer, and was built from relays for the Dutch Mathematical Centre, which later became the Centrum Wiskunde & Informatica (CWI). Jurjen Ferdinand Koksma was a Dutch mathematician who specialized in analytic number theory. Carel S. Scholten was a physicist and a pioneer of computing. Paul Michael Béla Vitányi is a Dutch computer scientist, Professor of Computer Science at the University of Amsterdam and researcher at the Dutch Centrum Wiskunde & Informatica. Piet Beertema is a Dutch Internet pioneer. On November 17, 1988 at 14:28 hours, he linked the Netherlands as the second country to NSFnet, a precursor to the Internet. Beertema was then working as an administrator at the Centrum Wiskunde & Informatica (CWI) in Amsterdam. Jan Karel Lenstra is a Dutch mathematician and operations researcher, known for his work on scheduling algorithms, local search, and the travelling salesman problem. Alexander (Lex) Schrijver is a Dutch mathematician and computer scientist, a professor of discrete mathematics and optimization at the University of Amsterdam and a fellow at the Centrum Wiskunde & Informatica in Amsterdam. Since 1993 he has been co-editor in chief of the journal Combinatorica. Bram Jan Loopstra was a Dutch computing pioneer who worked at the Mathematisch Centrum, Amsterdam and then at Electrologica with Adriaan van Wijngaarden, Carel S. Scholten and Gerrit Blaauw. From 1956 until at least 1963 he was technical director of Electrologica. At his death after a long illness on March 22, 1979, he was adjunct director of the Philips International Institute. Martin L. Kersten is a computer scientist with research focus on database architectures, query optimization and their use in scientific databases. He is an architect of the MonetDB system, an open-source column store for data warehouses, online analytical processing (OLAP) and geographic information systems (GIS). He has been (co-) founder of several successful spin-offs of the Centrum Wiskunde & Informatica (CWI). Cornelis Gerrit Lekkerkerker was a Dutch mathematician. Peter Boncz is a Dutch computer scientist specializing in database systems. He is a researcher at the Centrum Wiskunde & Informatica and professor at the Vrije Universiteit Amsterdam in the special chair of Large-Scale Analytical Data Management. ↑ "Quotes about Python". Python.org. Retrieved 2012-07-13. ↑ "SPSS and Data Destileries". Python.org. Retrieved 2015-02-24. ↑ Sumath, S; Sivanandam, S.N. (2006). Introduction to Data Mining and its Applications. Springer Berlin Heidelberg. p. 743. ISBN 978-3-540-34350-9 . Retrieved 2015-02-24. ↑ "Lex Schrijver receives EURO Gold Medal 2015". cwi. 2013-04-25. Retrieved 2018-02-19. ↑ "The World Wide Web Consortium - Benelux Office". W3C. Retrieved 2014-07-08. ↑ "Spin-off companies' details". CWI Amsterdam. Retrieved 2014-07-08. ↑ "Spin-off companies". CWI Amsterdam. Retrieved 2014-07-08.